It’s been a little while since we’ve done a post on a Steel Tongue Drum. 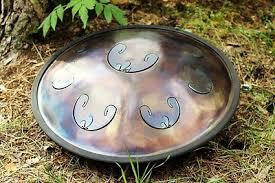 While beautiful instruments within their own right, within Handpan-circles, Steel Tongue Drum have always been somewhat regarded as “stepping-stone” instruments, being similar in many ways to a Handpan, and being much easier (particularly historically speaking) to acquire, than a genuine pan. A sort of “make do”, until you could get your hands on the real thing. And now that Handpan have become considerably easier to get your hands on, with the recent influx of new makers, the Steel Tongue Drum has in recent times taken a back-seat within our interests. Like what you hear? Find them for sale over at the RAV ETSY store: HERE.